Do international candidates have to take the TOEFL? Candidates are required to have a high level of proficiency in the English language. Language skills are assessed throughout the application process and are considered in an applicant's overall evaluation. Based on the evaluation, certain candidates may be asked to take the TOEFL exam. If I am asked to take the TOEFL, what is an acceptable score? A score of 100 or higher on the Internet-based test (IBT) is strongly recommended. Ross also accepts the Pearson Test of English (PTE) as an alternative to the TOEFL. A PTE score of 70 or higher is strongly recommended. TOEFL and PTE scores are considered valid if taken within two years of the application deadline date. One-year deferrals of admission are granted at the sole discretion of the admissions committee. Interested candidates must submit a formal request to the committee and pay a non-refundable deferral deposit to guarantee their seat in the following class. Tuition and fees are determined at the beginning of each program year and are the same for Ann Arbor and Los Angeles cohorts. Once set, tuition and fees do not change for the duration of the 21-month program. For current tuition rates, see the Tuition & Financial Aid page. What is included in the cost of the program? All accommodations and meals are covered for the duration of extended on-campus residencies. In addition, international and/or domestic travel required for the ExecMAP consulting project course is covered by sponsoring organizations and/or the EMBA Program. Tuition and fees do not cover monthly travel expenses. EMBA students are required to pay for all transportation to and from Ann Arbor and/or Los Angeles. If traveling from outside the region, students may be eligible (depending on distance traveled) to stay in EMBA Program facilities on the Saturday night after classes. Financial sponsorship is not required; however, candidates must demonstrate employer support of their participation in the program by submitting a Statement of Corporate Support form, signed by a supervisor or human resources representative. Self-employed applicants may request a waiver of this requirement. Financial aid is available to EMBA students. See the Tuition & Financial Aid page. Can I use my VA benefits to pay for the program? Ross is proud to participate in the Chapter 33 - Post 9/11 GI Bill and Yellow Ribbon Program. For detailed information, see the page for veterans' financial aid, and contact Ross Financial Aid with any questions. What happens when we are not in residency? Your studies continue with the materials and technologies for distance learning. With three courses typically taught concurrently, each month is organized to allow for one full week of online learning per class. Lectures may be streamed or viewed offline at your convenience, providing you with more flexibility. How much time should I expect to set aside for homework during the week? On average, 20-25 hours per week, including meetings and time spent reviewing online materials. This time may vary depending on the individual and on course material. You start with an extended residency at the beginning of each academic year, and return to campus approximately once per month for an all-day Friday/Saturday residency. There is a major field project course (ExecMAP) held in the second year of the program. During the weeks when you are not in residence, the program uses distance learning. For more information, see our schedule page. We target a class of 65 to 80 students in Ann Arbor and 30 to 45 students in Los Angeles. Will I be expected to work alone, or will I be assigned to work with a group of my peers? You will be assigned to a group that will include three to four of your peers. Although not all class work will be assigned as a group task, we recognize that many business challenges are analyzed and resolved with a group of colleagues. Groups will change at least five times in the program to maximize your interaction with other classmates and deepen your network. Students in Ann Arbor attend classes at Michigan Ross, in facilities designed specifically for the needs of executive education. 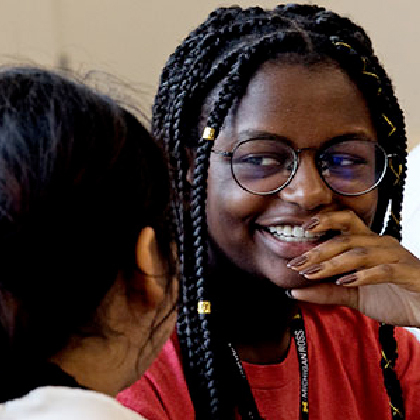 Students in Los Angeles attend classes at the Intercontinental Hotel - Century City, where the facilities and classroom experience provide an educational environment similar to the Ann Arbor campus. Where do I stay while in residence? Students in Ann Arbor will typically stay at Michigan Ross' Executive Residence, a first-class hotel that offers easy, refined living (or possibly a nearby hotel). Hotel rooms are located on the top three floors of the Executive Residence and Wyly Hall, with classrooms on the lower levels. Students in Los Angeles stay at the Intercontinental Hotel - Century City, adjacent to Beverly Hills, where executive amenities, fine dining, and top-rated service ensure you can focus on learning, not logistics. Can I choose a major for my Executive MBA? As with our full-time MBA program, the EMBA program takes a general management approach and does not include a major. Participants take the same classes at the same time with the same people. However, there are a number of opportunities to customize your experience based on individual interests. Starting in Term 3, you have the opportunity to customize your experience to achieve your specific personal and professional learning goals through 14 electives. In course assignments, you may choose to study specific industries and/or organizations. In ExecMAP, you are able to select from a variety of projects in different industries, countries, and functional areas. Will my degree be the same as if I attended the Full-time MBA Program? Yes, there is only one Master of Business Administration degree granted by the Stephen M. Ross School of Business at the University of Michigan. Who are the faculty teaching in the EMBA Program? Ross faculty often teach in many different programs, and the EMBA faculty are no exception. You will be taught by Ross faculty who are experts in their field: either in Ann Arbor or when the faculty fly to LA to teach our LA cohort. 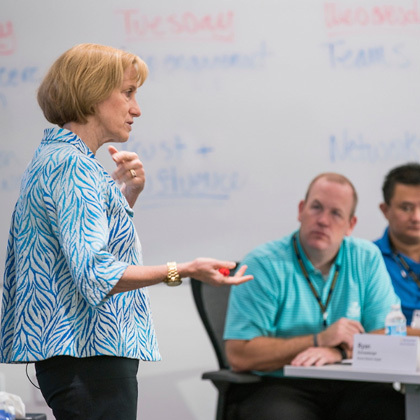 The faculty teaching in our EMBA program are typically some of our most senior and award-winning faculty, who have taught for many years in our full-time MBA core or teach some of our most popular MBA electives. Is the Michigan EMBA Program accredited? Yes, the Stephen M. Ross School of Business at the University of Michigan is fully accredited by AACSB International, the Association to Advance Collegiate Schools of Business. 21 months. Courses begin in August and conclude 21 months later in April/May. Is an international trip required in the Ross EMBA program? No, but international ExecMAP opportunities will be made available to students seeking an international option as part of their EMBA experience. What areas does your curriculum emphasize? The Ross EMBA curriculum emphasizes general management from a strategic perspective, along with personalized leadership development. It takes a comprehensive, results-oriented approach to real-world problem-solving and decision- making -- all at a senior level. Participants seeking advancement to the highest levels in their organizations need to complement their functional expertise with a broad-based knowledge of all the facets of business. Our EMBA curriculum provides a rigorous general management education that focuses on a strategic approach to business issues and problem solving. Parallel to the traditional courses is a leadership development program in which you develop your goals as well as identify strengths and areas for growth during the first year. In the second year, a number of different workshops will provide you with tools to reach these goals. Workshop topics include dealing with media in crisis situations, delivering powerful presentations, and managing teams of senior staff. ExecMAP and the elective courses in terms three and four provide opportunities to customize your learning based on your unique goals and interests. How does the Executive MBA Program differ from Michigan's Full-time MBA Program? The Executive MBA Program is customized to meet the needs of individuals in senior management roles, focusing on leadership skills needed to be successful at the executive level. Specifically, the program targets participants who have substantial work experience, with significant experience in a managerial/supervisory capacity. Candidates with fewer years of experience who are on a fast leadership track within their company are also considered. The collective professional experience of EMBA participants enriches the learning experience both in and outside the classroom. While there is no minimum work experience requirement, EMBA students typically have 10 or more years of progressive, full-time work experience, including five or more years in a supervisory/managerial role. The average age of participants in the most recent class was 40. The overall EMBA curriculum is more strategic in focus and designed to help participants make an immediate impact at work, while taking advantage of the participants' professional experiences. 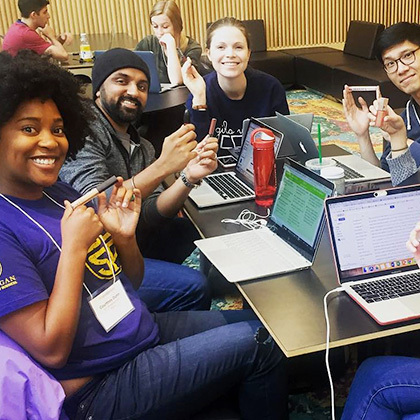 Both programs include Michigan's signature field study course, the Multidisciplinary Action Projects course, which partners students with organizations across the world. The day MBA program is a two-year, full-time program targeting individuals who have had approximately four to five years of work experience, typically at the analyst level; the average age of students is 28. Candidates are looking at their MBA experience as a way to "jump-start" their career as well as to explore different career options. The EMBA program is a "lock-step" program where all participants take the same classes at the same time (with the exception of one electives week), while the full-time program allows for a focus area (such as consulting, finance, or marketing). Is there a difference between the Ann Arbor and Los Angeles cohorts? Only in location. 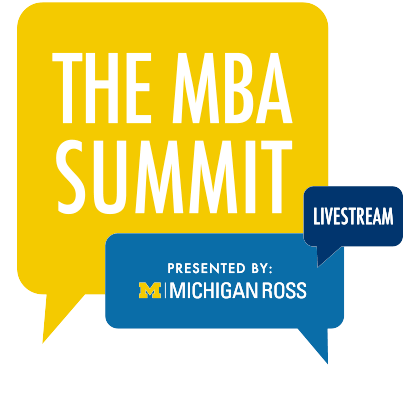 Whether in Los Angeles or Ann Arbor, students experience the same Michigan Ross EMBA. Both locations offer the same strong, general management curriculum, renowned Michigan Ross faculty, and high-quality learning and networking experiences during on-campus residencies. Both Ann Arbor and Los Angeles follow the same schedule format. 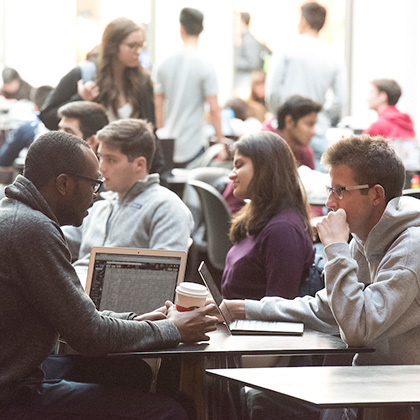 Students in both locations benefit from selected shared residencies and integrated networking opportunities. Do you hold information sessions? Yes. Multiple recruiting events are scheduled each year. You are also welcome to schedule a one-to-one appointment with an admissions counselor. Appointments are conducted in person, by phone, or via Skype.